Art is a reflection of particular moment in time, seized by the artist/artists, and immortalized by the viewer. Maybe as humans the inevitability that time will pass no matter what, deem us powerless, which through creation of art, we hope to be able to some how reclaim. Early morning, on 27th September 2013, one day before the scheduled second round of the presidential election, which the supreme court was intending to postpone indefinitely, putting the country precariously off course constitutionally,making way for major civil unrest, I saw something which, momentarily at least, gave me a sense of pleasure, in other wise disheartening day. 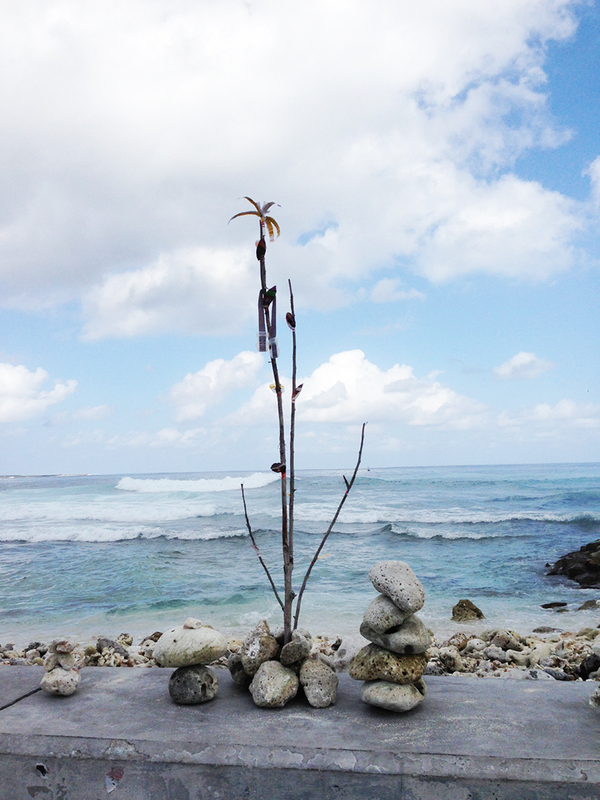 A group of young people (no more than 3 or 4), were taking different rocks/ corals from the nearby shore, and rearranging, and placing them against each other, and on top of one another to create new forms/shapes, along the protective shore wall at Raalhugandu, Lonuziyaaraikolhu. What was so awe-inspiring was the variety and number of different forms on display, placed one after the other, taking over more than 100+ meters of the entire wall. 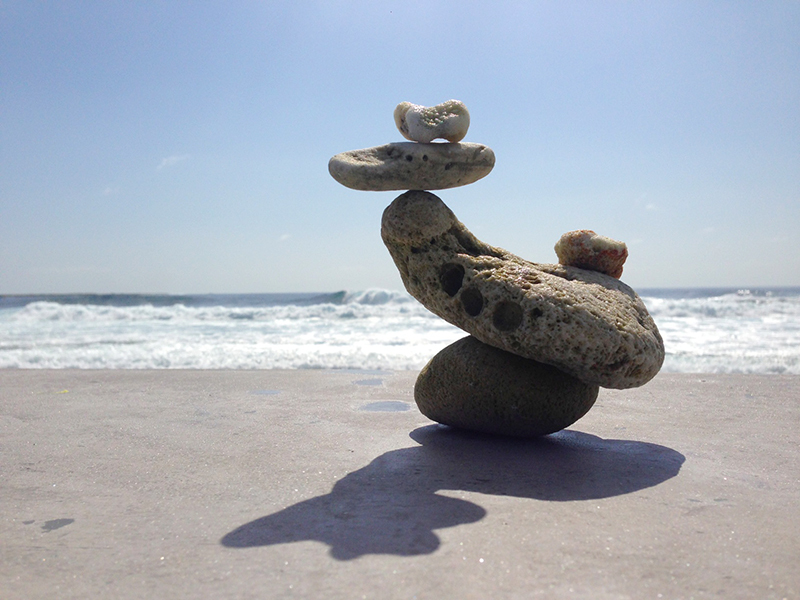 Each individual piece was shaped by the playful way rock complemented and had to balance on one another. No other tool or material was used to create the forms, other than intuition and trust of the makers giving freedom to the weight and shape of the material (rock) being used. Labeling these individual forms, as “Artworks”, would have sufficed, but doesn’t give the incident and the situation these forms were being displayed/exhibited, justice it seemed to truly deserve. For me, the overall incident, the situation, within which these forms came to be formed, displayed and viewed, totally redefining what we have been used to believe as “Art”. Art truly became democratic, and public, making it more engaging and interactive, blurring the conventional line between the maker (Artist) and the viewer (Interpreter), the definition of private (Closed Gallery) and the public space (Open Environment), as well as question the sanctimonious nature through which Artists and Art is valued in any society. The refreshing aspect of the whole situation was, the incident or the forms, didn’t seem to be presumptuous or had any need to define or be accountable to what it was, because, there was no clear indication of who had done it, or reasoning behind why it was done, making it all the more engaging and significant. The forms were documented extensively by the public, and posted on social media, like Facebook, Twitter, and Instagram. Most notably the individual forms evolved throughout the day and the next, continuously being reshaped and reconfigured by the people who crossed its path. Individual piece, around 5pm, 27th September 2013. When democracy seemed to be unraveling, taking us backward to a more dictatorial, and authoritarian state we knew to be long past gone, this particular incident or work, was able to immortalize a moment, that truly showcased human ability to engage with one another and bring people closer, hence, at least giving us some hope that time can only make way for progress.